A worker guides a 24-foot-long auger as a crane lifts it from a work area north of Wilshire Bl. Another auger at the lower left waits to be removed. Chain rigging is used due to the sharp edges and irregular shape of the auger. On a typical Wednesday in February 2009, over 120,000 vehicles flow east and west past Veteran Avenue on Wilshire Boulevard. If only one person sits in each car — not entirely impossible in Southern California, although unlikely — the number of people traveling on that stretch of Wilshire would exceed the populations of Inglewood or Santa Clara or Costa Mesa. Closing Wilshire west of the I-405 to construct a sewer, even if those closures occurred during off-peak hours, might petrify even the most calm and serene of Los Angeles drivers. Fortunately, jack and bore came to the rescue. 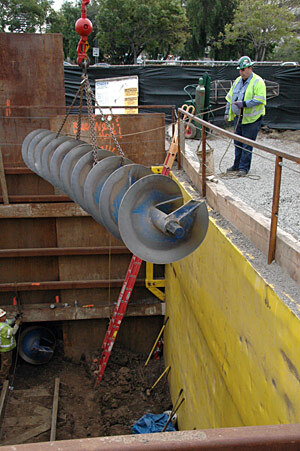 Although jack and bore may sound like an unsuccessful folk-rock duo, they are actually a small-diameter tunneling technique that enables a 24-inch-diameter sewer line to be driven under Wilshire Boulevard, without damming the river that is Wilshire traffic. Using a 30-inch diameter auger, which resembles an enormous blue drill bit, workers drill from the Veterans Administration property north of Wilshire to Veterans Administration property south of Wilshire. The “jack” in jack and bore comes from the technique that jacks or drives metal casing through the soil as the auger bores a tunnel. 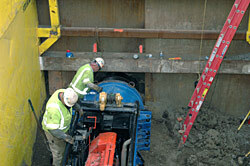 Workers use a diesel engine mounted on a short track to extract another auger from the new tunnel under Wilshire Bl. Two hundred feet of 24-inch diameter sewer pipe will be installed from north to south, while the same length of 18-inch wide sewer pipe will be installed beside the first. Boring a level path for these sewers is critical because sewer lines rely on gravity to continue flowing. For that reason, a specialized probe travels that route first, ensuring that the auger drills a level tunnel. Because sewer lines are placed deeper underground than other utilities, the boring had to occur below existing utilities that parallel or bisect Wilshire. Workers stand approximately 20 feet below the surface in excavated boxes with reinforced walls to drive the auger and tunnel casing through the soil under the street. Once the sewers are completed, these boxes — then closed at the top — will be accessed through manhole covers.